At the City of Moreland’s August Council meeting the draft Urban Forest Strategy was adopted. This is a major piece of policy for municipality wide climate adaptation and dealing with the Urban Heat Island Effect (UHIE). Moreland’s urban forest also provides significant shade and cooling to the urban environment, carbon removal, oxygen, biodiversity habitat, and reduced stormwater runoff. Much work from dedicated council officers like Alex English, Moreland’s Open Space Planner, and many others, have gone into making this strategy document important. The extensive community consultation resulted in a record number of submissions (257) on this policy, as well as 77 people attending consultation sessions. The adopted Policy document will be available shortly from the Moreland Council website. Moreland had a goal of planting 5000 trees per year for the last few years, but this tended to result in a poorer selection of tree and less maintenance resulting in a 20 per cent mortality rate. The officer report recommended 3,500 annual street tree and 750 park/creek trees, with much more quality control, which was also supported by a 60% vote from the community. An amendment at Council meeting increased the number of trees to be planted on a yearly basis back to 5000, with an extra $500,000 budget allocation for quality control of planting and ongoing maintenance. There was some concern whether this was appropriate in the debate at Council. Cr Abboud explains why Council decided to increase the number to 5000 trees per year. The increased rate of planting will help to arrest earlier the decline in the total urban canopy. 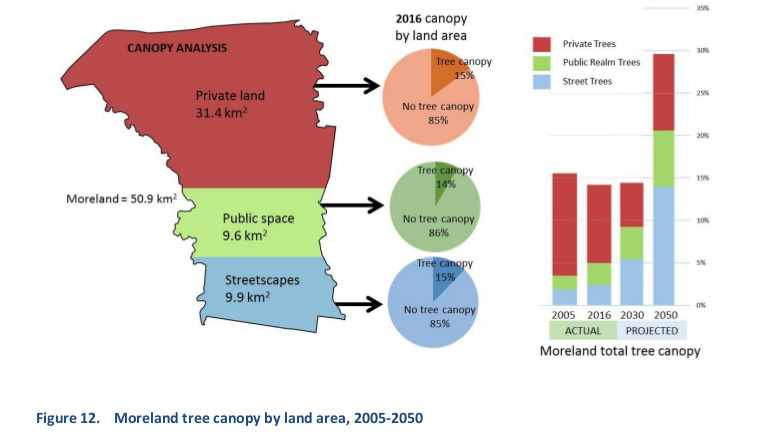 Moreland’s total urban canopy has been shrinking primarily due to urban consolidation (development). Most of the loss in tree canopy has been in the private sphere. Council street tree planting and parks planting have not been able to compensate for the reducing canopy in the private sphere. In the past high tree planting targets have resulted in poor tree selection for planting and reduced maintenance resulting in a 20 per cent young tree mortality rate. And the Moreland Urban Forest Strategy was passed unanimously. Well done Crs. The Strategy was adopted with a unanimous vote of Moreland Council. 57% of the current street tree population is comprised of trees less than 5 metres in height. The majority of these trees will not attain canopy dimensions that will significantly contribute to the amenity and environmental benefits in their streetscapes. 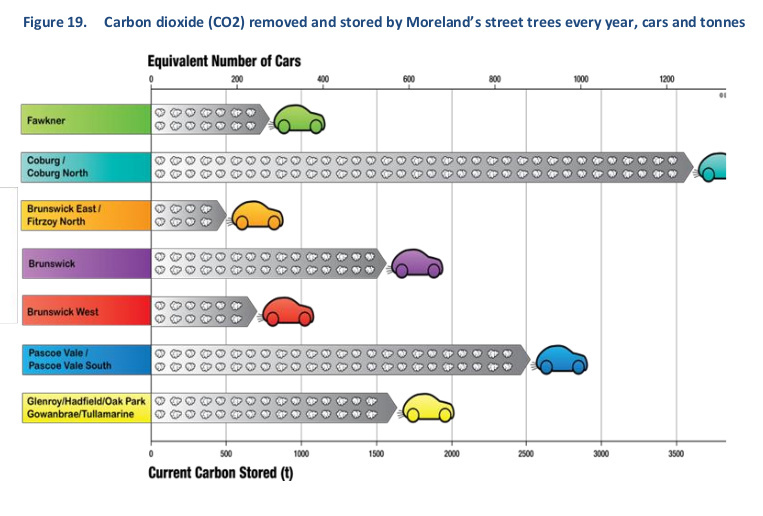 Moreland’s street trees store over 11 tonnes of carbon dioxide (CO2) and remove a further 912 tonnes annually. An over reliance on small, short-lived trees limits the potential canopy and benefits of the urban forest. The low species diversity of Moreland’s urban forest makes it susceptibility to the widespread effects of current and introduced pests and disease, and the risk of large scale loss of these environmental assets from climatic extremes. Overall tree canopy cover initially grew from 1989 through to 2005 but has since declined due to urban consolidation. 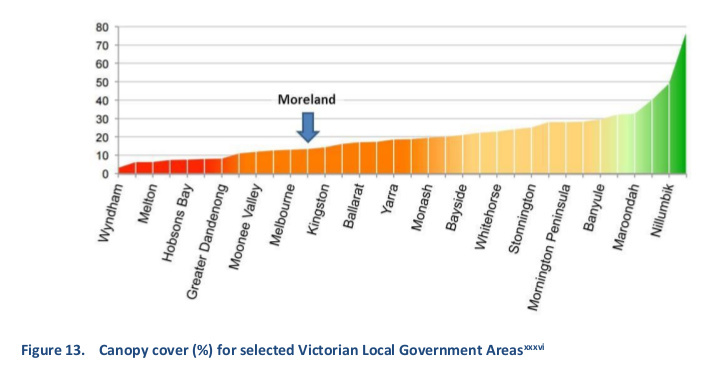 Street tree canopy and park tree canopy contribute just 2.4% and 2.6% of Moreland’s land cover respectively. Urban consolidation is the main cause of declining canopy cover in the private realm since 2010. A reduction in canopy cover in streetscapes has been caused by: the Tulla Freeway widening; new development cross overs; and, powerline pruning and clearance programs. 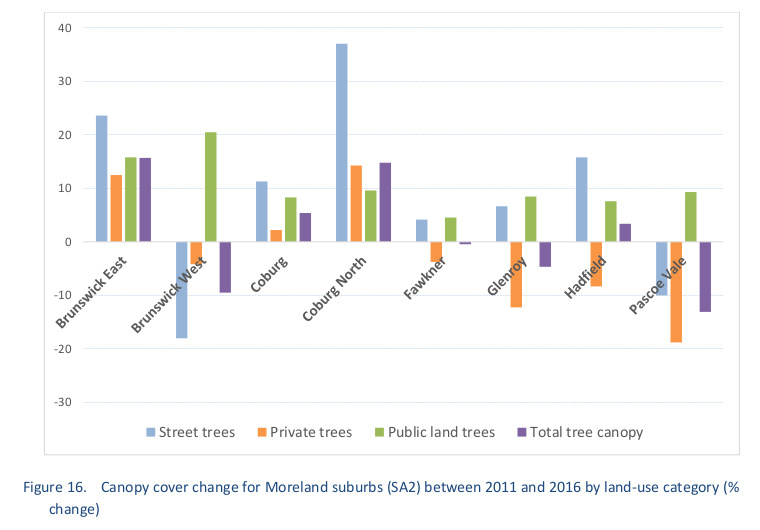 Canopy cover from street trees varies across Moreland’s suburbs from 4.5% in Gowanbrae to less than 1% in Hadfield and Oak Park. Entry filed under: climate change info, Moreland Council, urban forest. Tags: City of Moreland, policy, UHI, urban forest, urban heat island effect.